Who’s a roller coaster aficionado? Who? WHO? WHO?? (both my hands are raised while jumping up and down) Roller coasters are LOVE! :)I don’t really know what spurned this enthusiasm. 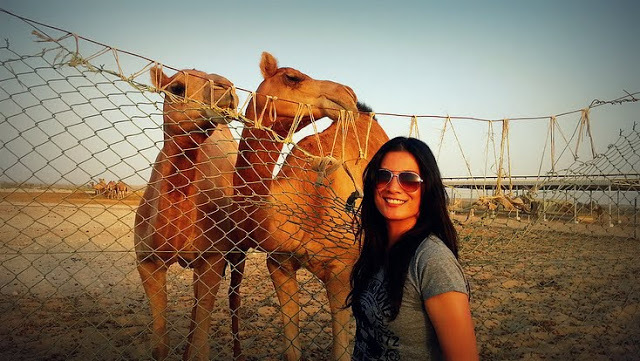 All I know is, wherever there’s a roller coaster, be it in a dodgeramaville theme park or Six Flags, I’m so there in the front seat.So this is how I spent my last day in Abu Dhabi. Riding THE WORLD’S FASTEST ROLLER COASTER. excited to meet my maker! 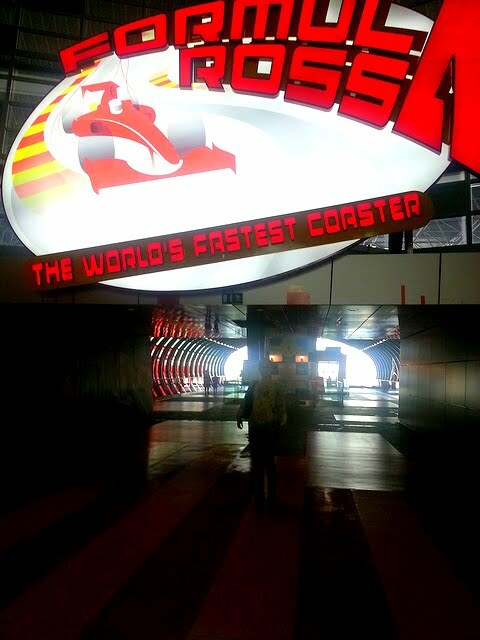 Formula Rossa is currently the world’s fastest roller coaster, accelerating from Zero to 240 KM/H in 4.9 seconds/ Zero to 100 KM/H in 2 seconds. And boy, do you feel this ever so strongly! Unlike most roller coasters, this doesn’t even have a slow intro or a “let’s creep up slowly and fall to your death” kind of build up. No. From the get-go, it’s pretty much sit down and ZOOM!! 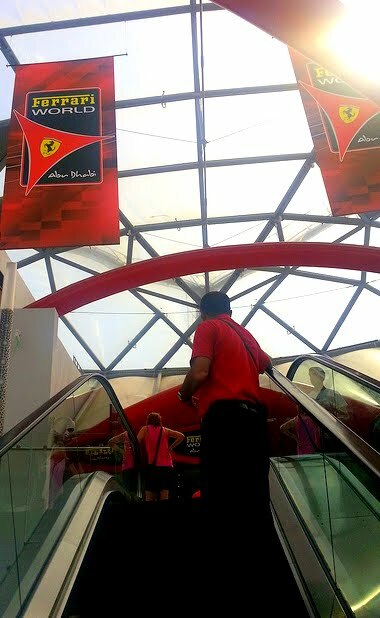 Tell you how fast Formula Rossa is. I had my hands up and mouth open (as very flatteringly demonstrated in the above photo). This was the very first throttle from Zero to 240 km/h. I was really mouth-open-wide happy! But as with all my roller coaster rides, there comes a point when I now want to bring my hands down to clutch anything and enjoy the ride (still screaming with mouth slightly smaller now) Except I couldn’t bring my hands down! It was like something was holding them up!! Ahhh… G-freakin’-Force!! And take note that all wore plastic eye-covers. It’s a must, unless you want to get out of the ride crying your eyes out, and justifying that they were tears of joy. Formula Rossa is not big on loops and drops (no loops at all but at that insane speed, Im not sure if I wanted it to loop! ), but the twists , turns, and most of all, just the sheer speed of it, makes up for the absence of loops and huge drops. I rode it twice, one after another. I thought I can make it to a third. But my gut (as in the organ, not the reason/intuition) begged no. There was only so much speed I could take at that point! So where is Formula Rossa? I forget the name of the ride but I remember it to be really enjoyable! 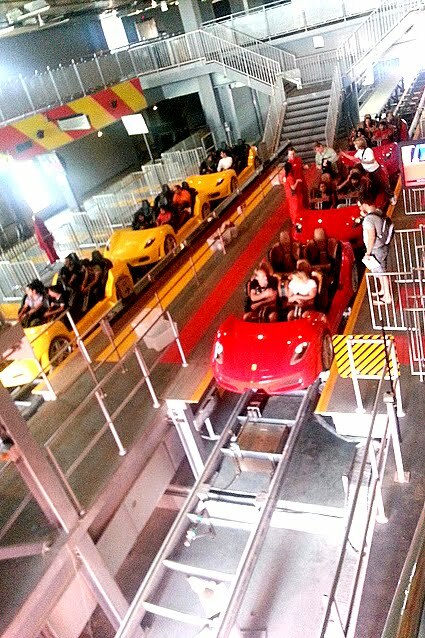 I wish Ferrari World had more rides. I hope they build more rides (even if all adult rides) in the future. They had a free-fall ride too, but it wasn’t operating when I was there. Well as much as I tried to describe what it was like being on the world’s fastest roller coaster, I don’t think it will do it any justice. Here’s a POV video of it. I have to say, it looks much much MILDER in the video than it really is! And here’s a close favourite of mine. 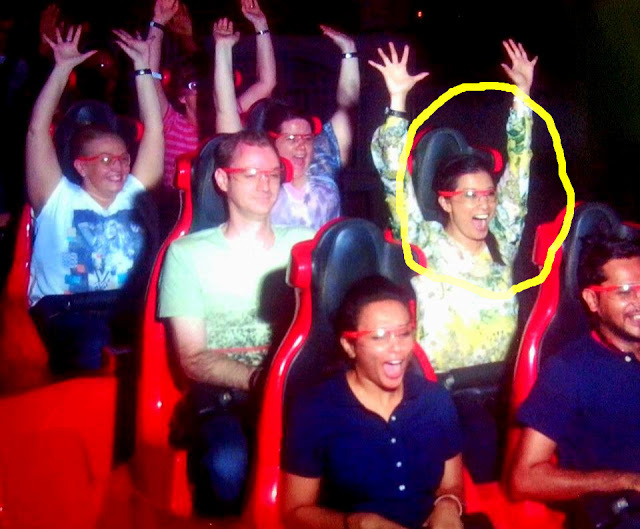 This is yours truly in Canada’s Wonderland– Behemouth! 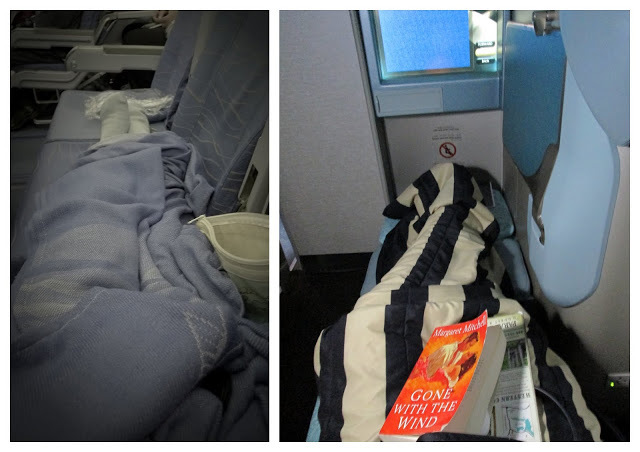 DO YOU LOVE ROLLER COASTERS TOO OR WOULD YOU RATHER SKIP IT AND GO TO THE NEXT RIDE? WHAT AND WHERE WAS YOUR BEST ROLLER COASTER/THEME PARK RIDE?? I am petrified of heights and things that go too fast! OUr last trip to the Gold coast i was freaked out by heaps of the rides at the theme parks and didnt end up going on most of them but i feel like i have changed a lot since then and im going to give them all super duper good try! Maybe ill end up here one day!